Perhaps it’s been because of the general lack of sunshine (save for a few days) lately, but I have been especially drawn to all things yellow in the last little while (see here and here). This Joe Fresh shell is the newest addition, and although it’s not warm enough to wear on its own yet, I know it’s going to be a go-to piece come summertime – I’m already envisioning it with the new camo print shorts I recently bought. What colours have you been loving lately? I love the color combos! I am looking to add quite a bit of yellow to my spring/summer wardrobe. Beautiful look! I myself have been leaning towards yellow, poppy red, and emerald green. I actually just posted a look where I’m wearing an emerald green dress and poppy red lipstick. Love the look. I feel drawn to aqua blue color and yellow. I love how fresh those colors look. You always look so put together and lovely! The yellow is beautiful on you. I wish there was a Joe Fresh in my area! So cute! Classic outfit! And so versatile for any lifestyle as well 🙂 Love it! I really love yellow on you! I also really like the bow around your neck, such a classy touch! 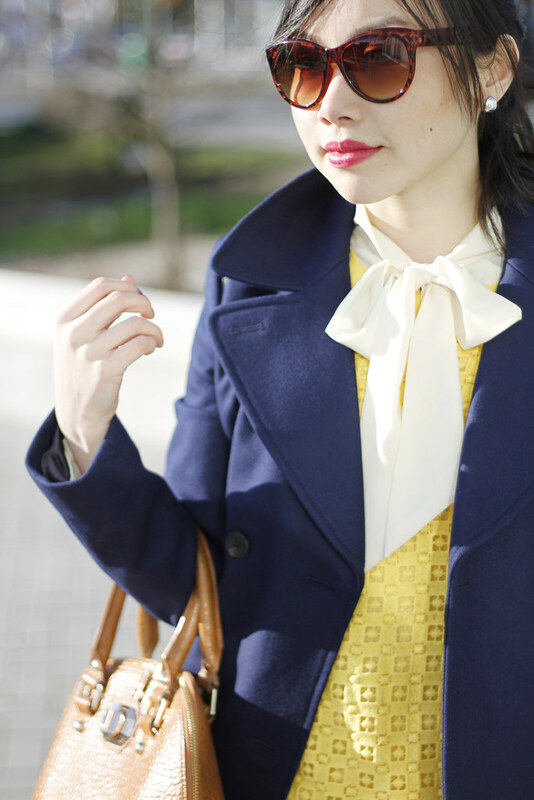 Love the blouse and the yellow shell!! Great layering! Hope you’re doing fabulously, love. Here’s to a great weekend! Miss ya. Pretty perfect outfit! I’m surely loving it all..
Navy and yellow look great on you! Nice transitional outfit! There’s nothing like yellow to make things cheerful and sunny. It’s my colour of the moment too, in shades from buttery pastel to bright neon. I like the way you paired that shell with navy, it really brings out the richness in both colours. Have a great weekend! Beautiful! I admire your ability to coordinate colours in such an interesting and chic way! Love the colours your put together for this outfit! 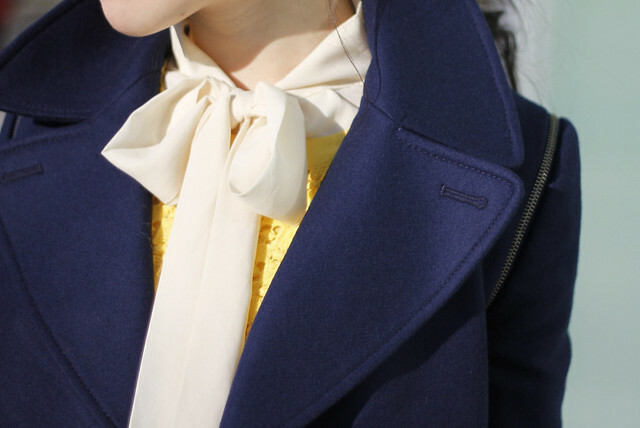 I love navy and yellow together. Great details with the bow, eyelet, leopard. Beautiful! cutie! i love these photos and this outfit! This is one of my favorite color combinations! Such a great way to introduce white jeans for spring. I love how that navy coat looks with them!